The first Office 365 question is, do organizations need to protect their data stored there? The answer is yes, Office 365 data needs protection. Almost every industry expert recommends that organizations take Office 365 protection into their own hands and even Microsoft makes it clear that data is the organization’s responsibility. The problem is those industry experts and Microsoft don’t answer the next question of HOW to backup Office 365 data. Register now and learn not only why organizations should back it up but also how they should do it. In response to the need for Office 365 protection, vendors have flooded the market with solutions but protecting Office 365 is more than just a “checkbox”. Data in Office 365 has value to the organization, is subject to a variety of compliance regulations, and is the target of cyber-attacks. 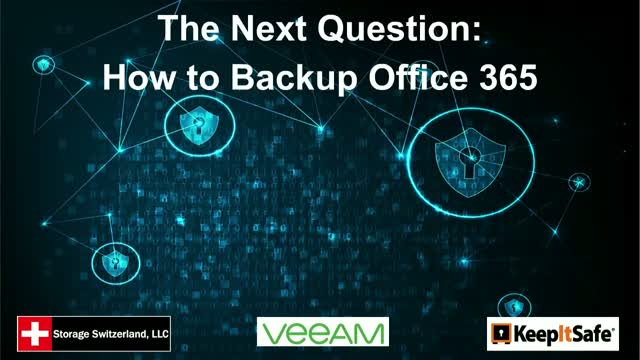 In our webinar Storage Switzerland, Veeam and KeepItSafe compare the various methods for protecting Office 365.